Last year I went to the launch of Fitbit’s latest wrist tracker – the Fitbit Ionic – and came away with one to review. For those of you who follow my blog and social media regularly you’ll know I’m a huge Fitbit fan so you can imagine how gutted I was that I was in the middle of a high risk pregnancy and wasn’t allowed to move a whole lot! Now that I’m just over three months postpartum I’m finally getting back into the swing of things exercise-wise so it feels like a good time to tackle this review (though I’m more limited on what I can do given I now have a toddler and a relatively new baby who refuses to like the buggy we have…). In fact, it’s actually probably a very good time to do an updated review as this week my watch had an operating system update come through. This has changed up quite a few things from when the Ionic was first released that are well worth a mention. I’m going to skip over the standard features and the Fitbit phone app that I’ve already previously talked about in my reviews for the Alta HR and Blaze models, and go straight to the juicy stuff that’s specific to the Ionic. For comparison I’ll relate the Ionic to the Blaze as that was previously one of the closest models to it features-wise, however the Blaze has now disappeared from the Fitbit website so am assuming it has been discontinued in favour of this and the new Fitbit Versa which is due out this month. A smartwatch that’s jam packed with features, the Fitbit Ionic is at the top of their range. This is also the first time they have opened up app development as a possibility which means this will be the most customisable tracker they have; it’s no longer just about what colour strap you attach when it comes to personalising it (think of this like a smartphone when it’s new out of the box, and then you can choose to add apps depending on your interests and needs). I’m usually pretty minimalist when it comes to jewellery and watches, so I wouldn’t typically pick a tracker with such a large screen. However, I’m practical enough to know you need a bigger one to fit the type of features this has on it. The watch itself has a smoother, sleeker feel to it than the Blaze does which is something I love. The Ionic comes in three colours – charcoal/smoke grey, blue grey/silver grey (what I have in my pictures on this post), and slate blue/burnt orange. 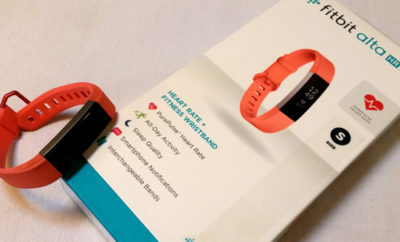 Unlike the other Fitbits available, this tracker comes with both a small and large wristband which has been great in our household as sometimes the husband wants to borrow my watch for a training session every now and then, but for previous trackers we’d had to buy an additional larger strap for him. I’ve got to admit I miss the beautiful leather strap I had on my Blaze but the one that comes in the box is practical and functional (and as always you can buy additional straps if you want to change the look). The high resolution touchscreen on this is crazy – just check out the picture below. This is one of the standard watch faces and the clouds and mist move through the valley on this image. The latest OS update has provided a huge library of watch face options to choose from – one of my gripes pre-upgrade was the limited face options available. There are even innovative virtual ‘pets’ where you can opt to have a dog or cat on your screen that uses your steps to keep it happy. Steps earn it treats and if you don’t feed it enough it will leave! Don’t ask me if it comes back… I haven’t had enough time to test it yet as I literally updated it yesterday. To be honest, I prefer to have what’s probably the most boring basic watch face that shows the time, date, steps and heartrate. This is so that I can see what I need to know at a quick glance. The Ionic comes with the standard classic features you’ll find on some of the other Fitbit trackers including all-day activity tracking, automatic sleep tracking and guided breathing sessions (as I mentioned before, check out my Alta HR and Blaze reviews for more info on these). However, here’s some more on the new and exciting features you can expect from this tracker. Take a deep breath and get ready… there’s a lot! The Ionic can finally store it’s own music without having to rely on another source, holding up to 300+ songs. You can play these directly through bluetooth headphones – and to that effect they’ve released their own ones called Fitbit Flyer. You can also use Deezer Playlists for music that’s more organised; I prefer different playlists depending on what exercise I’m doing so it’s great that there’s this option available. I mentioned this previously as well, but it’s a biggie. Now that app development has been opened up, there is enormous potential for personalisation with the Ionic. There are standard apps that already come installed with the Ionic (such as a weather advisor), however, you’ll find that over time more will come available as developers begin to take advantage of this new platform. Some of the apps that have already come out include Golf GPS, pill tracking, news and finance information, and games. Going for a run and don’t want to cart around your wallet with you for that reward coffee at the end (or a taxi back home if you ran too far!)? Add your debit or credit card details to your Ionic and make purchases anywhere that accepts wallet-free payments. This may not seem like a big deal, but the addition of intervals capability is incredibly useful as so much modern fitness programming is heading towards HIIT methodology (I’m sure this wasn’t on the tracker originally but may have come through a software update since I received it). I use HIIT a lot when training clients and I like to mix up the activity vs. rest times a lot. Unfortunately these times can’t be modified, however, I’m sure someone will develop an app for it soon if they haven’t already. The Fitbit Ionic uses the same app as their other trackers, learn more about the app features, sleep tracking and heart rate monitoring in my previous reviews for the Alta HR and the Blaze. One of the key reasons that people I’ve known have jumped ship from Fitbit was due to lack of GPS capability which can be important when you’re training for events. As with some previous models you can track specific workouts like weights, runs and rides. But now in Bike, Run or Hike mode you can use the GPS to see pace, distance and other key stats. You can finally take it into the pool! Another feature missing from previous designs was the ability to use them in the water. Now water resistant up to 50m, you can use the Ionic to track your training while swimming. Ideal for swimmers and multisport competitors. Or if you’re like me and frequently forget to take it off when you’re going in the shower. This may not seem like a big deal but I had a fight with the Blaze each time I wanted to change the straps out on it as you had to line up teeny rods with teeny holes to snap it into place. The Ionic straps pop on and off easily with a push button so you don’t have to deal with the frustration each time you want to swap them. Also the charger this time is magnetic and attaches easily to a port on the back (the Blaze you had to pop it out of the frame and insert it into a holder each time you wanted to charge it which was a bit of a pain and made it difficult if you needed to quickly grab it on your way out the door!). Their official name for it sounds a bit weird… maybe women’s health tracking might sound better? But you can now use the Fitbit app to log your periods, record symptoms, track ovulation and record patterns in your cycle. Keeping an eye on menstrual cycles can be a huge deal for those of us with hormonal issues (like myself with PCOS) or trying to get pregnant, plus it’s often a key indicator of good endocrine health. A great step towards an holistic approach to health tracking. I can’t really see any to be honest. It’s still a little large and functional-looking for my liking – perhaps you’ll never get away from this when you create a unisex watch. However, it’s certainly a small thing I can get past for the features the Ionic has. As I don’t keep bluetooth running on my phone all the time, I do sometimes struggle to perform updates and sync my tracker with the app. This has been an issue with all the Fitbit trackers for me though – not just the Ionic – and can usually be fixed by restarting my watch and the phone. There’s so much stuff on the Ionic it can take a while to get your head around navigating and starting/stopping timers and workouts, but once you’ve been through it a few times you’ll have it sorted. The Fitbit Ionic is absolutely packed with features that are so much more impressive than the other Fitbit models to date. The GPS function alone is a big drawcard, but it’s the tracking capabilities with an holistic health approach, and smartphone-like features that set it apart from other wrist trackers on the market. For more information on the Fitbit Ionic (RRP $449.95), visit www.fitbit.com/nz/ionic. [This competition has now closed] WIN: A Meadow Fresh Protein Boost & Fitbit prize pack!